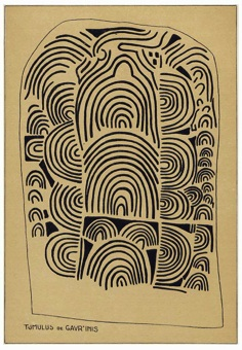 After these exercises for the eye, for sight, done, horizontally, on the base of the canvas - translations, which will, for the organ concerned, register a series of different states of rest - we can, now, begin to approach the other property of the eye - the one that implies circular movement. So, to the static character of the eye will succeed its mobile character. All circular movement turns about a pivot, a fixed point, which may be said to be the limit of the possible contraction of its static, spatial extension. We are not now concerned with trying to define movement in itself, but it still has to be taken into account. That is why I repeat that movement is independent of space, and that it passes this absence of space on to those bodies which, by shifting their position, adopt its nature. So that, when this happens, such bodies must not be considered in the same way as they were when they were in space, at rest. Here, they are extensions, surfaces (11); there, they are periods in a succession. And these are very different, one from the other. A man running is a period of the movement of his trajectory, while, at the start and at the finish, he is an extension. When he is running, he is in time; before and after, he is in space. These distinctions are indispensable if we wish to understand the difference that there is between the two natures - spatial and temporal - and to put them to the service of the real, whether it is the real as it is experienced by the painter, or by the philosopher or by the physicist. There is, I believe, the greatest possible confusion in these three domains - which, while they remain distinct, are still one in the nature of Man - and also in the two natures which correspond, relatively, to the mobile and the immobile. And, through this confusion, we have ended up in a state of impotence, for this reason alone, that we have not been able to distinguish the absolute reality - the support - from what is specific, and therefore relative, to these two manifestations. When the man is at rest, waiting for the signal to start his race, he is a body. He appears as a sign of immobile space. When he runs, he is a sign that signifies time. He appears to be in movement. Let the intelligence make an effort to understand! The relative immobility and the relative mobility are, then, very distinct. In order to come to know them, our reason passes from one to the other. The confusion derives from the fact that, for the observer, Man, when he is become a runner, is the same thing as he was when he was at rest, either before or after the race. The observer does not see the change that has taken place. He continues to see only the image of the man. And if a 'Kodak' were to be introduced to take a snapshot, the error would only be magnified in a scientific way, since the snapshot stops the course of the movement. It cannot register the movement, and so, suppressing the instant - the period - instead of the runner, it records, in a stupid, unintelligent fashion, the man, frozen in a position which is perfectly untenable. The observer and the Kodak are, both of them, deprived of reason and, thus, of intelligence. The one of them has no more understanding than the other. These differences in nature must be recognised by the painter. Indeed, that is where 'nature' is to be found. And so, the eye can be allowed to act according to its natural properties, and, from translation, it will pass to rotation. Let the painter, then, know that these properties cannot be jumbled up into one single phenomenon after the manner of the chimerical space-time continuum of the scientist. Space and time are not simultaneous, but they alternate, in an order that is unchangeable and indisputable: first, there is space/rest, then there is time/movement. The link between them and the relations of our everyday experience is provided by our reason, and by the conjugation of the verb 'I am', 'I was', and 'I will be'. The whole can be summed up by saying that our relativity is only a prefiguration in duality of the Unity which is absolute and transcendental. But that is another matter ... It is, however, right and proper that it should be mentioned. (12) sic! Should be 1916 - translator. A sculptor and painter, full of talent, and of a magnificent intelligence that was extinguished far too soon for us. In our age, irritable and irritated, only interested in the instantaneous, the immediate, we no longer know the value of memory, of that past that generates the movement that is to come. We forget, and we imagine this loss to be an advantage. Let us, then, stand up against the trend. 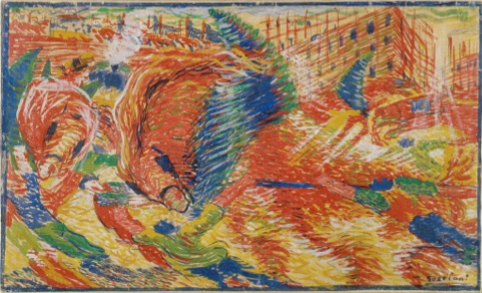 The Futurists, intuitively, with Boccioni at their head, saw the possibility of introducing movement into the painted work. An intuition that was profoundly right, but which could not be realised around 1912. It probably derived from the cinema, which was then in its early stages, from the machinism that was imposing on us the idea of speed through its motorcars, its aeroplanes and the general agitation of life. Painters, sensitive to these manifestations which had become part of the very fabric of their lives, tried to give them some sort of pictorial representation, but they were not yet ready to alter the Humanist position, based on the spectacle - on subjects seen in perspective. Observers, unaware of their eyes, they thought that they could arrive at movement by making images, or parts of images, succeed one another. They did not know that a distinction has to be drawn between, on the one hand, the body at rest, and periodicity on the other. They did not know that periodicity is something quite other than the body at rest, that when periodicity is under discussion, the body at rest is no longer present. They were quite unaware of the characteristics that are proper to each of the two functions of the eye; and that is why their intuition and their intentions could not arrive at any conclusion. Let us remember this struggle, which was, apparently, without consequence, and bear it in mind when we consider what came after it. Nowadays, the problem appears in a clearer light, and the painter, freed from the need to represent a subject, is obliged to find the order that corresponds to the object. And so he must, sooner or later, renew his connections with his sight and learn how it works. We have tried to outline its two natures - the one that suggests static space, the other that suggests mobile time, the two becoming, in practical terms for the painter, translation and rotation. Let us explore rotation further. 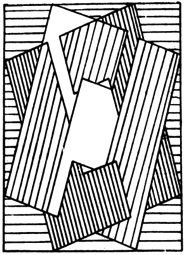 (13) La Peinture et ses Lois, ce qui devait sortir du Cubisme, Paris 1924 and in La Vie des Lettres et des Arts, vol xii, n° 5, nd [1922 or 3]. English translation, Painting and Its Laws, Francis Boutle publishers, London, 2000. When I return to what I wrote at that time, I can see to what extent I was still the slave of the intellectual deformation of the world about me, with its tendency to abstract from reality certain of its modes of behaviour and to treat them as if they had their own, independent existence. In fact, I felt more than I could understand. And the proof is that, while I talked about rotation, I did not achieve it. My plane turned on its axis, and my eye remained an observer, an observer who was interested in equilibrium, who was attached to the plane, and who was completely unaware of the authentic nature of movement. That is why I was content to register only two of the appearances which are evoked by the plane in the course of its rotary movement - two aspects: the first, when it appears inclined to the right; the other, when it appears, inclined to the left. The end result was that the rotation was suppressed and the translation brought back - no longer on the basis of the flat canvas, but, rather, on that of the inclination of its plane surface. All things considered, it was a valuable discovery with regard to the translation, which was freed from having to act exclusively on the basis of the plane. Nonetheless, what I had imagined and what I had proposed - rotation - was still nothing more than a word. And, certainly, I was quite unaware of the fact. Why? Because I still did not know my own eyes. I kept them stopped, the eye of the Kodak, the eye of the Humanist, and they could show me nothing other than what was stopped. Wanting rotation, I suppressed it, letting myself be ruled by immediate perception rather than by intelligence, by reason, which, alone, could have lighted me on my way. I observed what could be observed - the plane - and I did not see that, in its rotary movement, the eye no longer has any interest in the plane - that it describes a circular line marked by a succession of periods which register the presence of this movement, a movement that is of the nature of that which is accessible to the intellect, the intelligible, rather than of the sensible, of that which is accessible to the senses. All that having been said, let us, then, retain from this inadequate rotation the advantages which it has given to the translation. And let us recommend its use, without forgetting to add that this sort of St Andrew's Cross, formed by two planes, belongs to the order of the equilibrium of the painting-object, and not to that of its movement. Translation, corresponding to the basic verticality of the plane, is brought to its completion by the translation inclined on its axis - the bodily, and, consequently, static, structure is enriched. It becomes complex, and offers a greater variety of possible combinations. Harmony is provided for, but melody and counterpoint are still missing. For the real expression of rotation, of melody, is no longer the plane, but the line. Movement cannot be seized by sensation, by observation, by the Kodak. It requires the faculties of memory and of anticipation. Nor can it be grasped through the ingenuity of the cinema, which can only offer us a pretty crude impression of the agitation of external appearances. The cinema works on the basis of a series of shocks, a succession of images, which are of an order that is quite different from the order of the images we experience, continually, in our relations with the world about us. Of course it can be very amusing, but what is certain is that, without our even noticing the fact, it perverts our sight to the point at which that sight begins to disintegrate, and it throws the intelligence into a state of confusion, by falsifying the true nature of movement.